Eugene Sunshine, vice president of business and finance, presents NU’s plans for a biomedical research facility at Thursday’s Commission on Chicago Landmarks meeting. Sunshine argued that there are no viable reuse options for saving the old Prentice Women’s Hospital. Chicago’s landmarks commission voted unanimously to decline recommending landmark status for the old Prentice Women’s Hospital Thursday night, upholding for the second time Northwestern’s plans to demolish it and build a biomedical research facility in its place. The meeting was a reconsideration of the Prentice issue originally brought before the panel Nov. 1. At that meeting, commissioners evaluated Prentice’s eligibility for landmark status according to a set of architectural integrity criteria, as well as a report by the Department of Housing and Economic Development. Preservationists opposed to the commission’s conclusion then sued the city of Chicago. On Jan. 11, a Cook County judge found the commission did not violate city ordinances but questioned whether the landmark designation process was transparent enough. In response, the Commission on Chicago Landmarks chose to vote on Prentice a second time with consideration of a revised HED report. The report, written by commissioner Andrew Mooney, advised the preservation panel to refrain from recommending landmark status for Prentice because NU’s development plans align with downtown Chicago’s comprehensive plan. Furthermore, after review of preservationists’ reuse proposals for the old hospital, the panel found Prentice could not be adapted to suit the University’s needs. Northwestern promises to bring $400 million annually to Chicago in addition to 2,000 jobs and $450 million in federal grants for research. Preservationists allied under the banner of the Save Prentice Coalition spoke primarily in favor of various reuse options affiliated architects had created. However, because NU did not cooperate in any of these alternative use studies, none are perfectly suited to the University’s needs. Li Wang, a National Trust for Historic Preservation representative, drew ire from commissioner James Houlihan when he claimed rehabilitation of Prentice could yield hundreds of thousands of dollars annually in property taxes for city and county governments on top of millions in ongoing economic impact. Houlihan dismissed the suggestion as inaccurate because any increase in revenues would merely reflect the tax rate applied on all property owners in the area and should not be attributed to rehabilitation of Prentice. 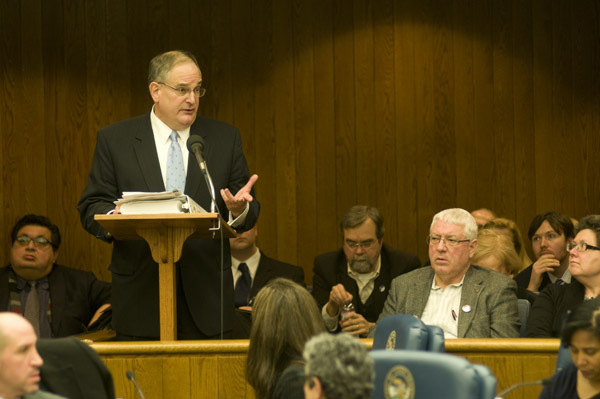 When asked by commissioners why the University never pursued reuse studies for Prentice even just to “pay lip service” to the preservationist community, NU vice president for business and finance Eugene Sunshine contended that NU had initially looked into reuse studies but concluded years ago that razing Prentice would be ideal for its goals. Sunshine added that if Prentice were landmarked, the University would have no backup plans for bringing Chicago a biomedical research center with all its economic benefits. The landmarks panel ultimately voted unanimously to back NU, but commissioners Houlihan and Ernest Wong expressed reluctance in doing so. The Save Prentice Coalition plans to appeal Cook County Judge Neil Cohen’s dismissal of its lawsuit.